The Treasury’s failure to appoint a woman to the Bank of England’s rate-setting committee is “truly staggering”, according to the chair of the Business Committee. Rachel Reeves’ comments came in response to the announcement that Prof Jonathan Haskel is to join the Monetary Policy Committee. The Treasury said four women and one man were shortlisted for the post. Prof Haskel’s appointment means there is still only one woman on the MPC. The Treasury revealed that 19 men and eight women applied for the post. 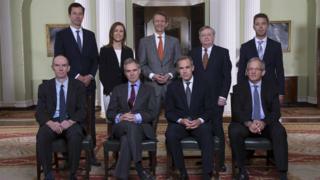 Ms Reeves said: “Eight of the nine strong Monetary Policy Committee are currently men and it is truly staggering that the Treasury has failed to appoint a woman to this role. Chancellor Philip Hammond said Prof Haskel’s “expertise in productivity and innovation will further sharpen the committee’s understanding of the British economy”. Sarah Smith, professor of economics at Bristol University, said Prof Haskell was “without doubt an excellent appointment, but this leaves only one woman on the committee”. Economics suffered from “serious under-representation of women at all levels”, she added. “However, the greater proportion of men than women in senior roles creates a gender pay gap,” he admitted. Earlier this month, the Bank of England’s deputy governor apologised after describing the UK economy as entering a “menopausal” era. Ben Broadbent used the phrase in a Daily Telegraph interview about economies that were, he said, “past their peak, and no longer so potent”. His remarks prompted a backlash and he subsequently admitted the phrase “conveyed ageist and sexist overtones”. And in an internal message seen by the BBC, he said he knew some bank staff had been offended and he was “truly sorry”. He told colleagues he should not have used the word.